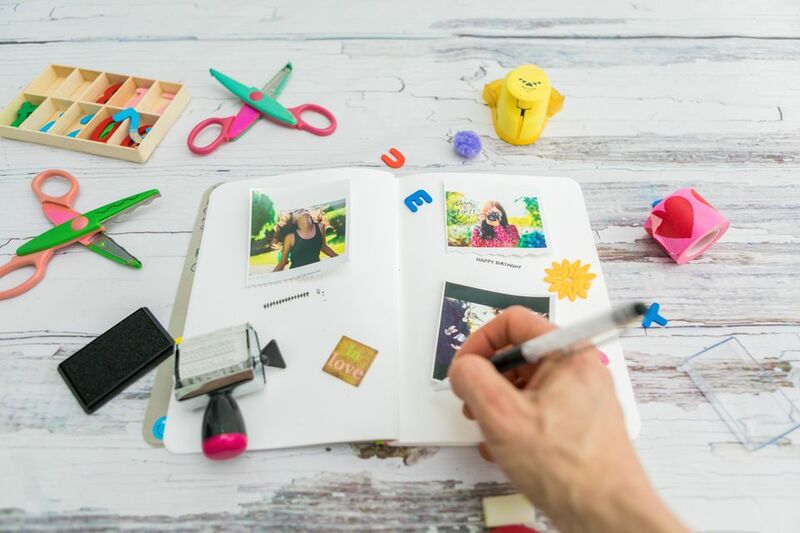 If you're new to scrapbooking, these simple steps will help get you started on creating personalized and memorable scrapbooks to display your photos. This layout has basic, clean lines that will look fabulous in your scrapbook albums. The free sketch in this gallery can be used again and again with different colors and patterns of paper for different themes and looks. First, select several photos of one theme. 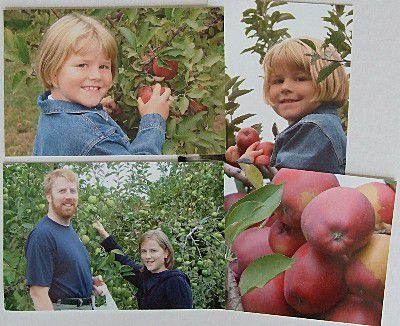 In this sample, there are four photos of a fall trip to the apple orchard. These photos will be used to create a single, 12x12-inch scrapbook page. If you're considering creating a two-page spread, you would choose several more pictures. Select one photo to be the main picture on your layout. The easiest way to create a balanced, pleasing scrapbook page layout is to have a single focal point. Here, the strongest of the four images will be the focal point of the page. Next, crop or reprint the other photos in a smaller size so that the focal point photo is the largest one on the page. Select colors of solid and patterned papers that accentuate the photos. The selection for this page includes hunter green, navy, red and white cardstock, with a pair of blue/green patterned papers as accents. The patterned papers have coordinating stickers that are perfect for this layout. To begin putting together the scrapbook page, you need a canvas. Here, a two-inch strip of the patterned papers and a four-inch strip of the solid green cardstock. Both pieces are topped off with a strip of paper or a border sticker. This is the background for the page. The focal point photo will be placed on the large field of green cardstock in the middle of the page. A technique used to frame the main photo is to double-mat it. First, this photo is matted with white cardstock ​and next with a slightly larger frame of red cardstock. This double mat gives extra importance to the focal point on the page. If you are not able to make the supporting photos smaller, double matting the focal point photo is often all you need to give it the prominence that it requires to balance the layout. A great time-saving technique in scrapbooking is to mat several photos all on one piece of cardstock. Here, all three of the supporting photos have been matted on a single strip of white cardstock. Try out the layout by placing the matted photos on the background page without adhesive. Dry-fitting the parts of your layout before adhering them to the layout is a great way to try out the placement of the pieces to make sure you like how they will look on the page. The photos on your page will lose their meaning over the years without supporting copy. Here the journaling has been printed on a sheet of white cardstock and trimmed to fit on a strip of navy cardstock that is slipped beneath the focal point photo. You could also handwrite your journaling if you wish, or use pre-printed quotes in fancier fonts. This particular scrapbook layout does not need very many embellishments. A simple nature-themed sticker added to the paper stripe at the top of the page is all that is needed to complete the scrapbook page. The completed scrapbook page is a simple and quick way to create a 12x12-inch scrapbook layout that uses four photos. It tells the story of the pictures in a clean and classic way that you will always be proud to display in your albums. Use this sketch as a guide to creating your scrapbook page. To save the sketch to your computer, simply right click the full-size image and select "save as." Please remember that all sketches on this site can be copied for personal use, but to share them with friends or blogs you should simply link to this page. Are There Certain Paper You Should Not Use in Scrapbooking?